This is about my personal experience at a workshop lead by a well known yoga teacher. This instructor has a very strong personal practice, is extremely knowledgeable and is quite successful in various business endeavors. It is possible that this was an off day for the instructor (we all have them), and while I felt disappointed in the class, I am sure there were others in the class who learned a lot. For these reasons, I am choosing not to identify the instructor. You know those rockstar yogis? The superstar ones from instagram who have, like, a million and a half followers? I always go to one of their workshops if they're coming my way because I feel like there's got to be something special about them to have such a huge following, and they must have something incredible to share. I figure that everyone knows something that I don't know, so if there's an opportunity to learn, I should. This summer, I went to a master class in LA. The guy (Dice Lida-Klein) was humble and kind, and laughed at himself when he screwed up and called for our right foot forward when it should've been our left. He was encouraging to my poor husband (I had dragged him, not realizing it was a level 3-4 class- we are talking floating handstands and wrist touches with your feet back up to handstands - um, yeah... oops), and he said the most amazing thing at the beginning of class. He thanked us for coming. I know that's not, you know, a mind-blowing thing to say, but this was one of the most sincere, heartfelt thank yous I'd ever heard. He looked everyone in the eye and said he appreciated us coming, because he knew we had a choice to be anywhere in the world, and we chose to come to a class, so he hoped that he could deliver something amazing. I noted that he didn't say, "Thank you for coming to my class" - it wasn't about him. It was about the yoga. That type of acknowledgment really resonates with me. Meghan Currie did something similar when I took her workshops in Germany. It was all about, in her words, "the recipe" of the class. The thoughtful and careful attention to sequencing unlike any other instructor has ever delivered, at least, in my experience. My time is valuable to me, and I work hard for my money, so when an instructor goes out of his or her way to say thank you for coming to class, and that they hope we love what's been planned, it tells me two things. One, they are compassionate and understanding of how valuable our time is, and two, he or she has thoughtfully prepared something for the class. I'm not saying it's necessary to acknowledge this, I'm just saying it really speaks to me. Recently, I went to another yoga workshop by one of those "rockstar" yogis and it was the total opposite side of the spectrum. This yoga teacher has multiple books and DVDs out, is well-known throughout the yoga world, and so yeah, I had expectations. Admittedly, this was my first error. I should always expect nothing. I paid roughly $70 dollars for a three hour class, which I felt was reasonable, because as I've learned as an instructor myself, the studio will always take a cut, and if you're really big, you may have a talent agency who facilitates logistics and therefore takes a small percentage as well. Of course, when you're traveling the world doing these workshops, you also need to pay for your flights and hotels and other expenses, so ok, $70 seemed understandable. I arrived on time and saw the instructor in the lobby. Despite being in the studio on time, the instructor started the class ten minutes late and ended five minutes early. The workshop had been described an in-depth adjustments and assists class for teachers or serious students. I was so looking forward to this, because I know that in my professional life, this is where I need to improve. I can sequence a class well, I can connect, I can read and react and change things up to meet the students' needs. I know basic adjustments and assists, but I am a bit timid in my approach. The description of the class made me hopeful that I would learn a variety of ways to adjust and assist, and therefore improve my teaching. When we were asked to raise our hands, less than half the class were teachers. Initially, I didn't give this a second thought, but in retrospect, I wonder if the plan (assuming there was one) was adjusted accordingly on the fly because the few tips we were given were basic fundamentals I had learned in my own teacher training. For the first hour, we sat in a semi-circle and the instructor spoke about their personal experience with yoga. About their teacher, and their travel stories. The stories were funny, and now I feel like I know a bit about this instructor's background, but to be honest, it had nothing to do with adjustments and assists. For the next two hours, the instructor then demonstrated three poses and how to assist and adjust them. And then we'd get in partners and practice. Three poses. Three. Little. Poses. After, we were shown how to get into lotus pose, but the instructor didn't believe in assisting lotus, so in the end there were three assists (that I had learned in teacher training), and one lotus pose. In a way, it's my fault. I shouldn't have had high expectations. I should've approached the workshop openly, and with a better outlook. And, admittedly, I was irritable to begin with. I had driven hours to be there, got caught in atrocious traffic, felt sick the entire way due to having an allergic reaction to onions (of all things! ), discovered a filling had chipped in my tooth on the drive and spent most of the drive wondering where in the world I was going to find an English speaking dentist (update: found one, going today, wish me luck!). And, I admit, I had expectations of this teacher, because they have a huge presence in the yoga world. I expected a thoughtfully designed workshop. I expected professionalism in terms of the start and end time of class. I expected the entire three hours would be dedicated to learning about assists and adjustments as described. But on the other hand, for someone who talks often about serving others and delivering the "message of yoga", the workshop felt a lot like: here are my travel stories, and here's everything you need to know about me and my practice. But how does that help us students? Students who have paid $70 for guidance and leadership, given that you're (and this is in the instructor's own words), "part of the generation that must lead the path of yoga since Pattabhi Jois and B.K.S. Iyengar have passed." Further, the assists were quite basic, and it didn't seem like a whole lot of thought was put into designing the class. Or maybe we were taught basic assists because the majority of the attendees weren't teachers. Either way, I was disappointed. Yes, I learned a cool trick about how to facilitate a better forward fold (literally press your pubic bone back). And, from a fellow teacher who was there, I learned the great phrase, "Reach through your knees" for cobbler's pose. -Class size. My least favorite thing in terms of teaching is having a huge class size. Why? Because then I feel I'm spread too thin and the students aren't getting the personalized attention they deserve. For this reason, I always make sure to limit the number of students for retreats. In this experience, there were so many students (maybe around 45?) that I had to sit at the back and I couldn't see what was demonstrated. We were invited to move so we could see, so I found myself standing and peeking over everyone for the majority of the time. This wasn't too big of an issue, but in my opinion the quality of the class was compromised. -Class approach. When I approach teaching, I try to remove myself as much as I can in the equation. I go into the class prep thinking that the class is about them. It's for them and this is their time. I am there to guide. Not that I have any special enlightenment or anything, but I view my job as just showing them the path and helping them on their way. It's not a me and them thing, it's an us thing. -Acknowledging time and money. I don't know why this is a big one for me but sticking to the allotted time is a yoga class pet peeve of mine. I always strive to start and end my classes on time because people's lives are busy. I know we try to encourage people to slow down in yoga, but the reality is that people have things to do (appointments, errands) and people to be present for (children, spouses) so I need to deliver what I promise. Further, when I write a class description for a workshop or a retreat, I put a lot of thought into the plan. I ask myself what I can share that will be useful to people, and how can I design a class to deliver it. When I come up with the price of an event, I ask myself, knowing what I can deliver, if I would be willing to pay that. So looking back, I am truly bummed I didn't learn any new assists or adjustments. But, I am glad that I went. As with any disappointing experience, I am learning there is always something to be taken away for personal or professional growth. Let's talk I'd like your opinion - am I overreacting? When you sign up for a class do you have expectations or do you let things unfold naturally? What would you do if you felt let down by a masterclass? 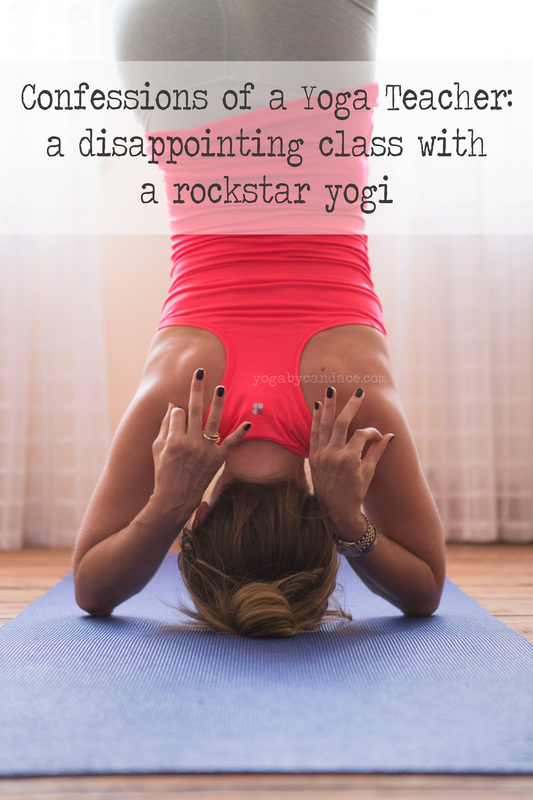 Have you ever been to a "rockstar" yogi's class? How'd it go for you? Related The time someone threw up on me on an airplane.